An all-new anthology of cross-genre fairy tale retellings, featuring an all-star lineup of award-winning and critically acclaimed writers co-edited by Dominik Parisien and Navah Wolfe. Once upon a time. It’s how so many of our most beloved stories start. Fairy tales have dominated our cultural imagination for centuries. From the Brothers Grimm to the Countess d’Aulnoy, from Charles Perrault to Hans Christian Anderson, storytellers have crafted all sorts of tales that have always found a place in our hearts. Now a new generation of storytellers have taken up the mantle that the masters created and shaped their stories into something startling and electrifying. Packed with award-winning authors including Naomi Novik, Garth Nix, Marjorie Liu, Charlie Jane Anders, Aliette de Bodard, Amal El-Mohtar, Sofia Samatar, Theodora Goss, Genevieve Valentine, Max Gladstone, Catherynne M. Valente, Jeffrey Ford and Seanan McGuire, this anthology explores an array of fairy tales in startling and innovative ways, in genres and settings both traditional and unusual, including science fiction, western, and post-apocalyptic as well as traditional fantasy and contemporary horror. 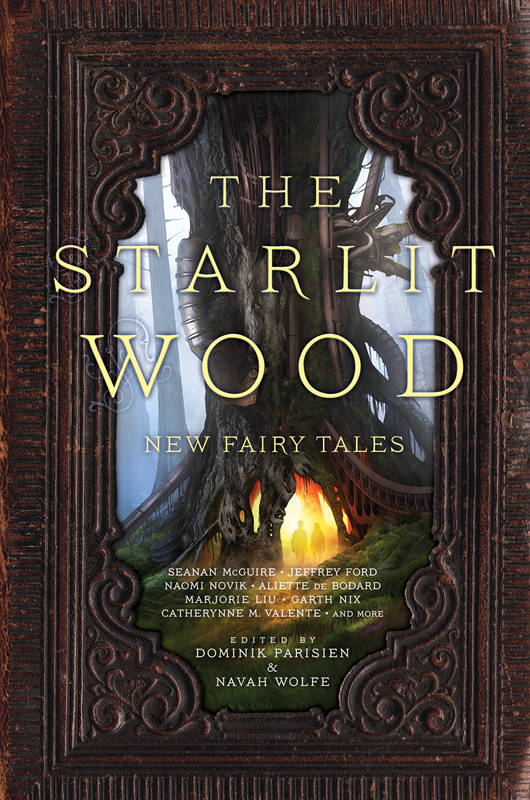 From the woods to the stars, The Starlit Wood: New Fairy Tales takes readers on a journey at once unexpected and familiar, as a diverse group of writers explore some of our most beloved tales in new ways across genres and styles. What are Navah’s and Dominik’s favorite bits? NAVAH WOLFE and DOMINIK PARISIEN It’s nearly impossible for us to pick a favorite bit in The Starlit Wood. The stories are just so good. Each of the authors did a phenomenal job finding new ways to retell these fairy tales– beautiful sentences, awesome characters we want to follow around, and emotional punches that stuck with us for days. There are scenes in every story we wanted to talk about here. So instead of trying to narrow it down to a single favorite bit, we both decided to talk about our most personal bits. Navah We all know that representation is important. We discuss it constantly, how critical it is for kids to see themselves in fiction, for people to have a window into different viewpoints, to open their eyes and teach them empathy. It was rare for me, as a kid, to see myself represented in the books I read. Sure, there were Jewish characters like Kitty Pryde in X-Men, but they were few and far between. Science fiction and fantasy stories weren’t exactly overflowing with young Jewish women. Even though the stories I loved felt universal in their emotions, I felt invisible within them. But I grew up, and I went out into the world, and I found my space, and it didn’t even occur to me how powerfully representation would still resonate for me until I read Naomi Novik’s “Spinning Silver.” “Spinning Silver” is a retelling of Rumpelstiltskin, and it’s one that turns tropes and expectations on their head. It’s hard to not see at least a whiff of anti-Semitism in the origin story, which famously features a long-nosed villain who wickedly values gold above all. Naomi’s version is a decidedly Jewish fairy tale—but in an entirely different way. In her story, the miller’s daughter becomes Miryem, who is not only from a family of moneylenders, but becomes one herself. It’s a story of family, and the wonderful world-building is filled with Jewish culture, history, and traditions. And most satisfyingly, “Spinning Silver” is a fairy tale where the power and choices are all in the female protagonist’s hands. This story sang for me. It was familiar, it was electric. I saw my own beautiful traditions, religion and culture within the skin stretched over the old offensive bones, and it felt like coming home. My one regret about this story is that I can’t send it to Past Navah. I am so thrilled to have it in The Starlit Wood, and even more thrilled that Naomi is planning on expanding it into her next novel. I can’t wait for readers to discover it and Miryem. # Dominik As far as I can remember I’ve loved shadow and doppelganger stories. They lend themselves particularly well to psychological and uncanny narratives, explorations of the duality of good and evil, and the overall investigation of issues relating to identity. My favourite book of this type is James Hogg’s 1824 novel, The Private Memoirs and Confessions of a Justified Sinner, and I’m always eager to read new stories in this vein. When Navah and I started approaching authors for The Starlit Wood we encouraged them to retell both classic and lesser-known fairy tales, indicating some of the classic stories we would like to have in the book. Amongst the stories singled out was Hans Christian Andersen’s The Shadow, a story we don’t often see retold. Theodora Goss expressed interest and surprise in The Shadow’s inclusion, and I admitted that I had selfishly included it as it is one of my favourite fairy tales. I’ve always been surprised that The Shadow isn’t better-known, especially in this day and age where individuals can exist as almost entirely different entities or personas online and in person. Theodora jumped at the opportunity to retell it – she’s taught the story several times – which pleased me to no end. The result was “The Other Thea”, one of the longest stories in The Starlit Wood. The fact that she focused on a female doppleganger was particularly exciting as – as she points out in her author notes – female dopplegangers don’t frequently appear in classic stories. I’ve long admired Theodora’s fiction, and to have her retell one of my favourite fairy tales in our book made her already wonderful story resonate with me on a whole other level. LINKS: Amazon B&N Indiebound Powell’s Simon & Schuster Saga Press Navah’s Twitter Dominik’s Twitter Dominik’s blog BIOS: Dominik Parisien is an editor, poet, and writer. He is the co–editor, along with Navah Wolfe, of several anthologies for Saga Press, including The Starlit Wood: New Fairy Tales. He is also the editor of the first anthology of Canadian steampunk, Clockwork Canada (Exile Editions). He has worked with Ann and Jeff VanderMeer on various anthologies, including The Time Traveler’s Almanac, Sisters of the Revolution , and The Bestiary. Dominik’s essays, fiction, and poetry have appeared in Uncanny Magazine, Strange Horizons, Shock Totem, and several anthologies, including Imaginarium 2013: The Best Canadian Speculative Writing, The Playground of Lost Toys, Those Who Make Us: Canadian Creature, Myth, and Monsters, and other venues. His fiction has twice been nominated for the Sunburst Award. Find him on Twitter @domparisien. Navah Wolfe is an editor at Saga Press, Simon & Schuster’s science fiction and fantasy imprint, where she has edited critically-acclaimed novels such, Borderline by Mishell Baker, Persona by Genevieve Valentine, The Mountain of Kept Memory by Rachel Neumeier, and A Green and Ancient Light by Frederic S. Durbin. She was previously an editor at Simon & Schuster Books for Young Readers, where she worked on many bestselling books, including some that have won awards such as the Printz Honor, The Pura Belpré Award, The Pen/Faulkner Award, The Stonewall Award, the Lambda Literary Award, and the Schneider Family Award. Find her on Twitter @navahw.